Some years ago when I first began teaching myself how to make soap, I tried a recipe for Goats Milk Soap. I tried and failed abysmally. The bars I cut at the end were yellowy-brown and crumbly and I couldn’t figure out what I did wrong. I’ve made a lot of soap since then and understand now that my temperatures were too hot. I’ve had similar crumbly disasters when I’ve used too much honey in recipes or when I’ve made honey soap at too high of a temperature. You’ve got to be mindful when using sugars in soap and that includes milk. This recipe is a little different from many of the others I’ve shared in that the temperatures are low. They’re low so that the milk in the recipe doesn’t scorch and change colour, and they’re low to avoid any strange crumbly messes. The lye-water will be at room temperature when we mix it into the oils, and the oils themselves will be just twenty degrees (°F) above that. I don’t usually soap at these temperatures but it needs to be done to avoid your milk soap turning brown. Oh, and you’re going to need both space in your freezer and refrigerator for this recipe too. For full information on soap making safety and equipment please head over here. It’s important to read it before trying to make soap the first time. 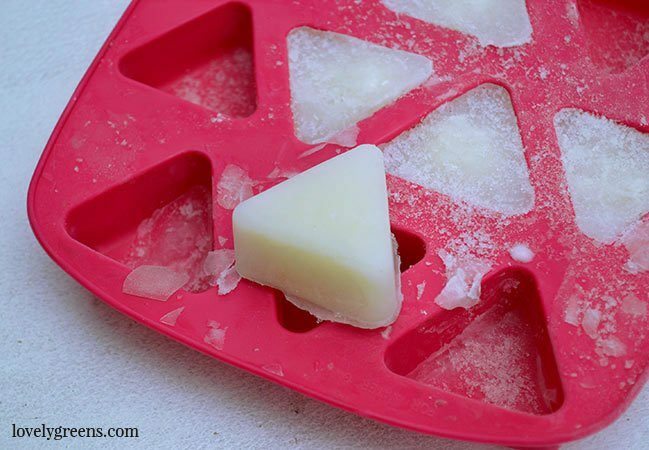 Pour the goats milk into an ice cube tray and freeze. Set yourself up in an area with good ventilation — on the doorstep or outdoors is perfect. Pour the Sodium Hydroxide into the water and stir with a stainless steel spoon. Be careful not to breathe in the fumes. Stir until the lye is completely dissolved and then set the jug aside to cool to 100°F (38°C). As soon as you add the ice cubes to the lye water begin melting the solid oils. In a stainless steel pan, heat the coconut oil and shea butter on very low heat until just liquefied. They’ll melt quicker than you think so don’t be tempted to turn up the heat. When the solid oils are melted, take the pan off the heat and pour in the liquid oils. Being already room temperature, they’ll cool the hot oils down. Stir well and keep an eye on the temperature. 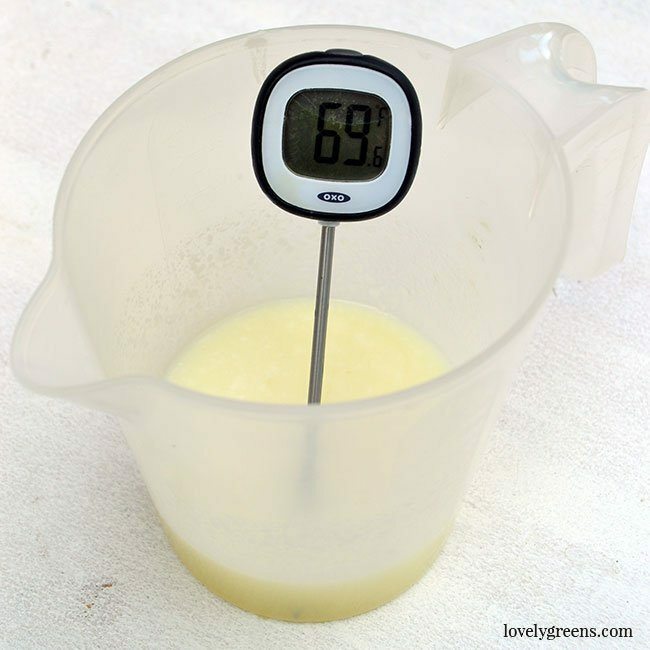 You want the oils to cool to 90°F (32°C). When the lye-liquid is fully melted and the oils are the right temperature, pour the lye-liquid into the oils. Immerse a stick blender into the pan and use it (turned off) to stir the contents together. Then bring the stick blender to the middle of the pan, hold it still and pressed to the bottom of the pan and pulse for a couple of seconds. Repeat the stirring and pulsing until the mixture begins to thicken. It will take a couple of minutes. When the soap batter has thickened to the consistency of warm custard, stir in the drops of Grapefruit Seed Extract. It works as an anti-oxidant and helps prolong the shelf-life of your bars of soap. It’s not a preservative but rather an agent that helps stop oils from going rancid. Pour the soap into your mould, whether it’s the Silicone Soap Mould, an empty paper milk carton, or something else. Now line the exposed part of the soap with plastic wrap and pop the mould into the refrigerator. Leave it there for 24 hours. 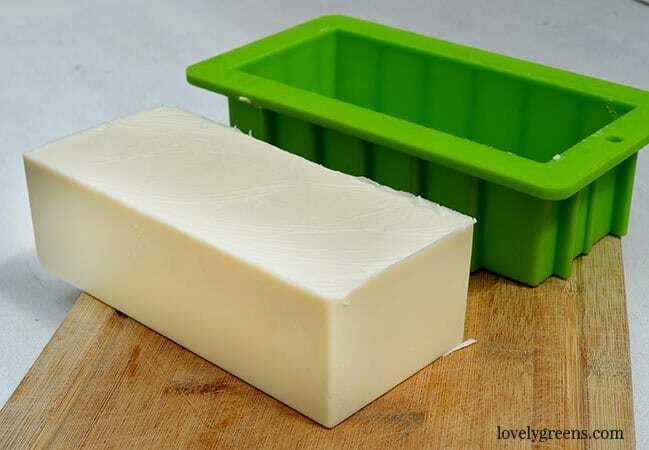 Take the soap out of the refrigerator the next day but leave it inside the mould. Set it someplace on the counter and leave it there for three or four days to harden up a bit. This soap is very soft when it comes out of the mould and could break or get stuck if you try to cut it too soon. 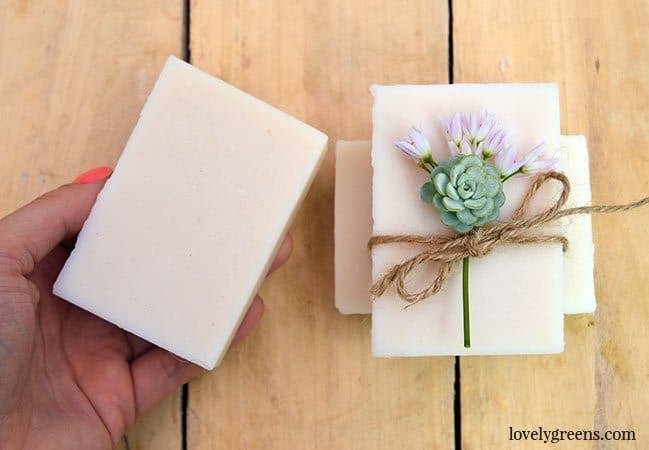 The lather and feel of these handmade goat milk soaps is fluffy and silky. 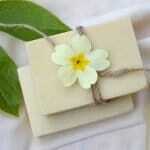 The scent is softly milky and making the recipe just as it is will create bars ideal for sensitive and dry skin. If you’d like to scent these, you may add essential oil at the same time that you add the Grapefruit seed extract. 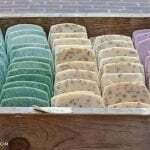 Read more about scenting soap with essential oil here — the article also provides recommendations on how much to use of each when making handmade soap. I’m just getting into soap making, and I intend to start with your goats milk recipe, which I’ll stick to rigidly. I’ll let you know how it turns out. However, I just wanted your opinion, on the assumption that it works out well, as my intention is to focus in future on producing herbal soaps. 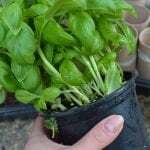 Do you think that adding herbal oil and a corresponding colouring to your recipe (say sage oil and/or chopped sage and a little green french clay) would work, or is there a potential problem that I need to know about? I think your website is really good, by the way, and your videos are great! I just love your website and how you explain everything. This is my first try at goats milk soap. I got my silicon ice trays and opened my very first bottle of goats milk and when I started pouring the milk into a container to weigh it before putting it in the ice trays, I noticed that there were some curds in the milk. 🙁 I checked the date and it expires next week, so it should be okay. Is that normal? Or should I ditch the milk and go get a fresh bottle? Milk that expires next week is still in date 🙂 Just strain the curds out and freeze the liquid. There’s a chance that the curds might scorch and turn your soap brown but if that does happen, the soap is still fine to use. Would it work if I were to ad lemon or orange zest to it and ad a citrus touch? Would that change the recipe? Also, If I were to emit the grapeseed oil, how long would it be good for? 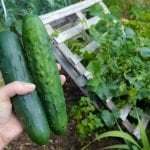 Could I use sunflower oil instead of Coconut oil? Lastly, is this recipe good for eczema and/or dry and irritated skin? Sorry for all the questions! It sounds like a very good recipe! Unless you’re an experienced soap maker I don’t recommend changing anything in a soap recipe. It’s more complicated than just taking an oil out and replacing it with another. However, you could add the citrus zest if you wish — half a teaspoon will do for this recipe. It won’t add scent but will add specks of colour. I made the Goat Milk Soap recipe today and it went exactly as you described. Thank you for this recipe and your detailed instructions. The soap looks beautiful and the whole process was very satisfying. I made soap 20 years ago and it did not go as smoothly as this recipe did. I appreciate Lovely Greens website, a true gem! Can I use cold pressed coconut oil in the place of refined coconut oil? You could but your recipe would be more expensive and might have a faint coconut scent. Hi, what does it mean if my soap was crumbly? Also can I use all goats milk or must I use hall and hall (water/goats milk)? 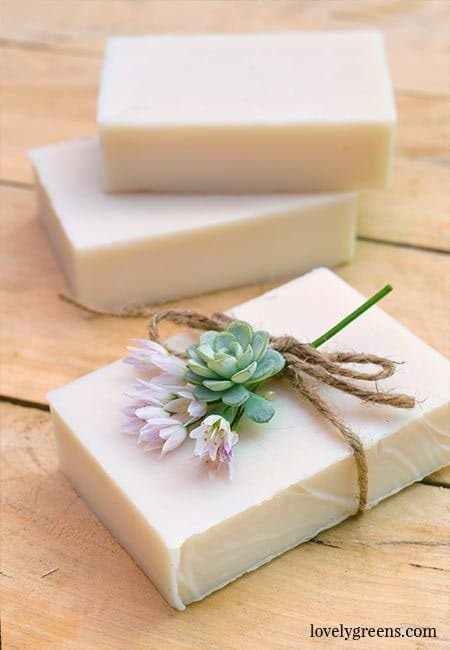 Crumbly soap can be an issue when making soap with sugars like milk, honey, or actual sugar. It’s not the sugars themselves though that cause the issue — it’s the extra heat they generate. It can cause the centers of the soap to gel and the outer edges to not go through gel. In other types of soap it’s just a color difference that happens in this case. In sugar soaps it can sometimes cause crumbliness. Avoid this by soaping at lower temperatures and either ensuring the bars go through gel completely (insulate or gently oven process) or don’t go through it at all (refrigerate). As for the amount of milk — yes you can use all milk. Your chances of soap coming out crumbly or discoloured go up though if you do not take precautions. I am new to your website and I just love it. I tried your goat milk receipe today and I hope it will turn out right. My only worry is that the soap didn’t thickend as much as it used to do to reach trace with my other recipe. I was wondering if goat milk powder could be an alternative to the liquid one. Did you ever try it? 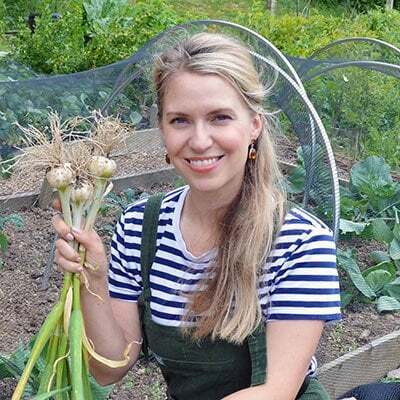 Hi Tanya, I’m interested in making goat milk and also goat whey soap so my question is- could it be done only with milk or whey without any water? Also, should I use fresh or pasteurized milk- is there any difference, because I’d rather use fresh. The more milk you use, the higher chance of it scorching. Saying that, give it a go and see how the soap looks, smells, and lathers afterwards. As for fresh or pastueurized — I don’t think it really matters. Hi! I am wondering if there is a way to color this soap a light gray. I love the white, but I am worried the white won’t be as white as I need it to be. So my next option is a light gray. Do you have any ideas? 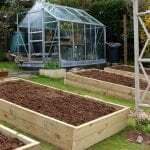 Hi Lesley, I’d recommend you try making it first. This recipe will give you pure white bars if you follow the instructions. If you’d still like to tint it a light grey you can use a little activated charcoal. I was wondering if it is possible to color this soap to a light gray? If so, what would be the best colorant to use as well as maybe add to the soothing properties that this soap has. I love the white, but I’m concerned that it won’t be as white as I was hoping for. So my next alternative is a light gray. Hi – how much soap does this recipe make – just looking at possible mould sizes? Love this easy to follow instructions, and the comments have cleared up many questions. Is there a print option for the goats milk soap? Blessings to you and your family. 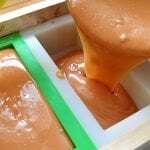 Is this recipe compatible for hot process soap making? I am new to soap making. I tried your recipe and love the way it feels, but I don’t really have the time to wait 4 – 6 weeks since we are getting ready for farmer’s markets. I wouldn’t recommend it for hot process — the soap will turn brown with the extra heat. Love this! Can I leave out the anti-oxidant if I don’t have any on hand? If I do leave out the Grapefruit Seed Extract, do I have to change the recipe? (Also thinking of throwing in the honey at the end). I made soap twice with this recipe and it came out perfect both times. I appreciate the detailed instructions that provide everything needed to make this soap. I used almond fragrance for the first batch and lavender/lemon for the second. hi Tanya , i love your site, can i avoid to put the soap in de fridge? what’s the difference? Thanks so much Mirta! You don’t have to refigerate your soap but beware that it might not turn out as creamy white as in the photos. It might even get a gel circle in the centre. Not a biggie as far as functionality (it’s still very usable soap), it just won’t look as nice if it discolours. Hi Tanya I love the way go around explaining things. I am a big fan of urs. I had one question though, can I used cow or buffalo’s milk instead of goat’s milk. Of course you can 🙂 Buffalo milk soap — interesting! Hi there, I love this site. Have just made my first batch of lemongrass soap and it has turned out quite brittle and crumbly. Am I able to reheat and repour? Thanks. Brittle and crumbly doesn’t sound right — check to see if the soaps are lye-heavy (with a PH test) before rebatching. You might have mis-measured the ingredients. It’s happened to us all! I’m following your posts and thank you for sharing with us what you create. 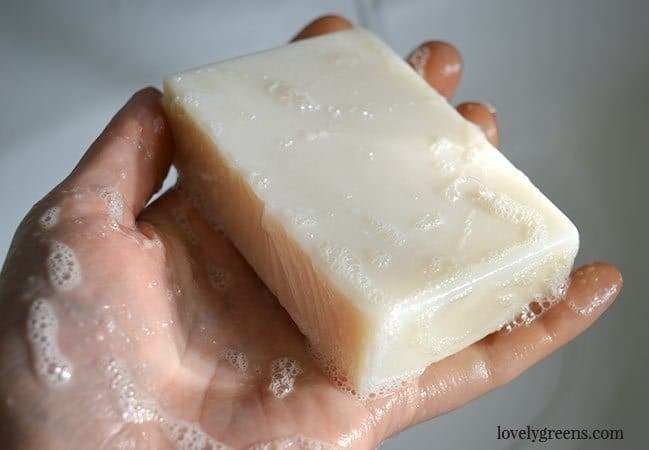 I love soap with goat milk and I think I will try as soon as possible this way to make it. I have tried several times to put the goat milk to the trace, up to a maximum half of the amount of liquid, and the result is quite pleasing. The advantage of this method is that milk should not be frozen, but just brought to room temperature. Thank you again. Tanya, Love your instructions on how to make soap. 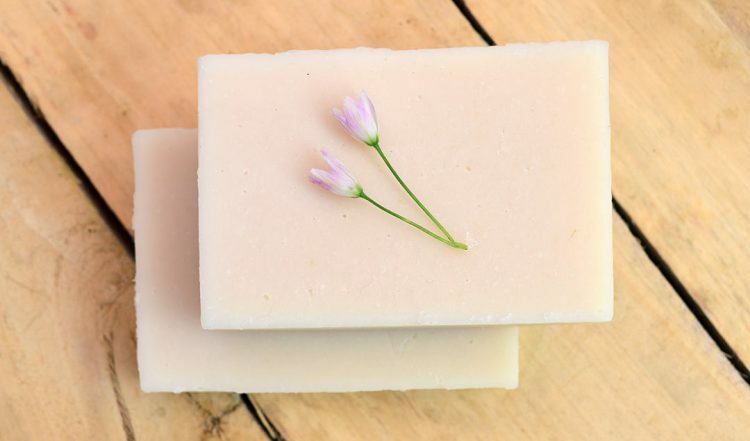 Do you have a receipe to make Goats Milk soap without lye? You can’t make soap without Lye Terri — even the ‘Melt and Pour’ soap you can buy pre-made is created using lye. Best recipie I’ve seen!! Thanks for sharing! Thanks so much for the recipe ! My first time to your site. Very detailed, easy to follow directions. You don’t get all scientific with us. I used to make soap. Back in the hippie days. LOL ! My how things have changed ! This will be my first time trying again. The thing I want the most is lather. Have you any suggestions to make that happen ? Thanks again. Hi Leatrice 🙂 The coconut oil and castor oil in the recipe see to it that you’ll get a great lather. Welcome to my site and happy soaping! I have been making goats milk soap for years and it’s always the light brown color. I am thrilled to give this recipe a try. Thank you. Great looking soap mold! Where can I buy one? There’s a link in the article to where you can get your own! Hi Tanya, I tried making Goats milk soap a few days ago, and it turned to mush, none of the other recipes say to put it in the freeer, I have sodium lactate, i think that is what it is called, should I use that instead of putting in the fridge. I really enjoy your videos, and all that you do. I just want my cold process soap to turn out. LoL any advice is good. You don’t put your soap in the freezer Joyce — you put it in the fridge to cool. If your soap turned to mush it could be a couple of things: the recipe isn’t good (check a recipe’s values in the SoapCalc before using it), you haven’t waited long enough before cutting it (don’t unmould for 3-4 days with softer soaps), or your soap false-traced meaning the oils cooled and hardened in the pan before they could be bonded with lye. I suggest you use my recipe instead and follow all the steps to the T. You mention substituting ingredients in a previous recipe in a Facebook comment — please don’t do that. It’s the surest way to fail when making soap.